February 14 is a joyful date for lovers and marketers. While couples celebrate their feelings with gifts and intimate dinners, companies double their email volume and rake in billions in sales. But when your competitors jump on the occasion and push sales, how can you stay afloat amid inbox clutter and set new records for email revenue? Here are some quick-win strategies for transforming your newsletter into a Valentine’s Day conversion machine! Best of all? You can use most of these Valentine’s day newsletter ideas for other occasions, too. 1. Make a promise and DELIVER. Do you know one of the main reasons your customers don’t shop online before Valentine’s Day? It’s not because they don’t love your offers, or because they feel your inventory is overpriced. They fear being LATE with a perfect gift for their significant other! Can you imagine running home with a box of chocolates on February 15? I bet you wouldn’t get many “conversions”, not to mention the increased “hard bounce rate”. A footer that repeats the promise. Once the sale is made, it’s all up to FedEx! 2. Use wish lists and gift guides. Here’s a quick fact: your potential customers will visit only 1-3 retail sites before they purchase a Valentine’s Day gift. Takeaway? Remove shopping obstacles and drop a hint in your Valentine’s email about the ideal gift for their partner. Your newsletter will prevent visitors from wandering around on your website and perhaps sailing away to a competitor’s e-store. Promote “wish list” ideas in your pre-holiday emails, so subscribers can point their significant other to the right gift. You’ll reduce the number of returned items and become a trusted V-Day shopping advisor! 3. Create irresistible subject lines. Like the holiday itself, your newsletter should be filled with love. Starting with your subject line, make it clear that your email is a special Valentine’s Day promo. Use emojis (hearts, etc.) to make the subject line stand out from inbox clutter. Try something unique that matches both the Valentine’s Day theme and your industry. And if you want to know more about the words you should use in your Valentine’s Day newsletter subject lines then check out this article – 18 Words to Skyrocket Your Email Open Rates. 4. Appeal to the right gender. Can you guess how much time subscribers devote to reading your email? Only 2-5 seconds. And if you don’t appeal to them with a relevant offer, your newsletter may get deleted, marked as spam, or simply abandoned. So use all the data you’ve gathered about your subscribers — and on February 14, gender is the most important. Segment your email marketing list by males and females and create offers that appeal to each. Don’t waste their time by forcing them to browse irrelevant promos. They’re already busy enough with Valentine’s Day preparations. They need gifts — not for themselves, but for their significant other. How to run the test? 5. Tell a story and sell a dream. Marketers often underestimate the power of email copywriting. Sure, fancy graphics highlight and sell your products. But the story is what can put your products in the right context and sell your subscribers the dream you offer..
A few sentences with a magical description of your Valentine’s Day promotion can have a bigger impact on sales than a discount or free shipping. You’re selling a trip for two? Why not call it “Taking Your Love Higher” and “Love at first flight”? Describe how your beloved will be spoilt with the getaway. This will create an irresistible image that encourages subscribers to click-thru to your website. Want to get people talking? Make up a hashtag and encourage people to share their special stories. Valentine’s Day is not only about shopping for exclusive gifts for your SO. All the jewelry, watches, lingerie, and funny/cheesy gadgets… When your industry is not really “romantic”, you’ve got to get creative. As I mentioned before – the email’s copy is everything. First, you need to find out how your product, or offer, can be connected to the theme of love, couples, relationships, feelings, and dating. Then, use a fun play on words to give your subscribers a valentine’s-y, warm, and fuzzy feeling. 7. Remind readers about gift cards. A spa session, dinner for two, or a new dress? Men have the same dilemma each year when given the mission of finding a perfect Valentine’s Day gift. Traditional gift cards, vouchers and e-gift cards can be a lifesaver for those who can’t figure out their partner’s preferences. 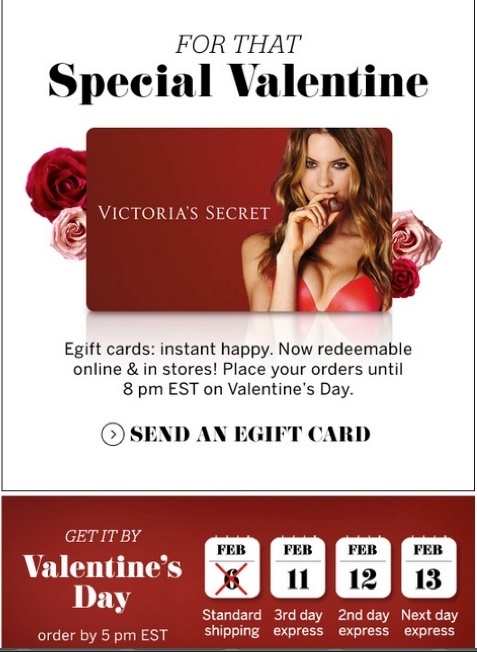 A Valentine’s Day gift card offer from Victoria’s Secret. 8. It’s all about giving. Use Valentine’s Day to show your customers you really CARE about them and want to make them feel special. 9. Design a one-of-a-kind email template. Not many holidays have such a well-defined visual identity as Valentine’s Day… well… except Christmas. The color schemes (red, shades of pink, white) and special symbols (roses, hearts, etc.) make Valentine’s Day newsletters stand out from your usual emails. Tip: The GetResponse design team has created Valentine’s Day email templates you can use for free! Just log in to your account and go to Email Creator. 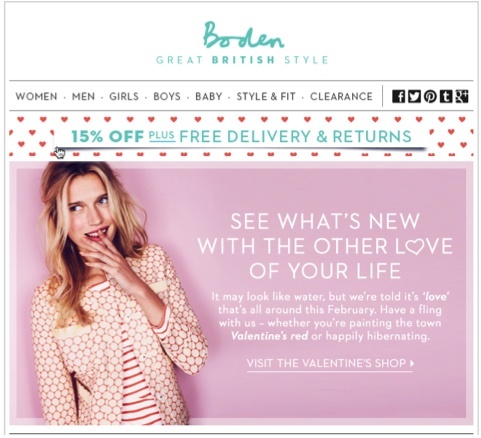 Johnnie Boden email newsletter with a Valentine’s Day theme. A special offer for Valentine’s Day from Taziki’s, with a romantic theme. 10. Think of different ways to celebrate. Just because it’s February 14, not everyone has to be in a romantic relationship. And that means many people celebrate Valentine’s Day without shopping for gifts and looking for a perfect candle-lit dinner recipe. Look at this email from Mouth that caters to people who had their heart broken right before Valentine’s Day. It uses a fun copy and puns to make the hard times a bit sweeter. Below, the email from House of Fraser suggests that either you love this day or hate it, it’s just an occasion to buy something for yourself. 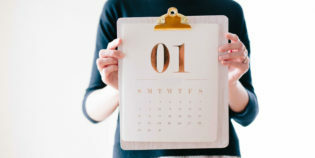 If you know your audience will enjoy it, you can target people who celebrate Galentine’s Day or Anti-Valentine’s Day, with friends or all by themselves. 11. Show some unconditional love. Among all these Valentine’s Day email tips and tricks you can use to spoil and convert your subscribers, there is one that can make your audience feel truly loved. It’s giving them something to enjoy, for free. And here, I don’t mean offering free shipping if they buy from you (like I advised to do in tip #8). I mean something a bit more personal, with no conditions and money involved. It can be an ebook, a recipe, DIY project instructions, a special playlist. Make your copy sound like a love letter, and make your customers fall for you. 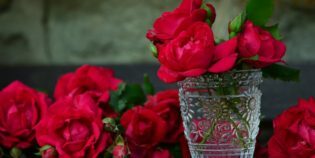 I hope we’ve inspired you to create a one-of-a-kind campaign with these Valentine’s day newsletter ideas. If so, share your email designs in the comment section and let us know how they performed! 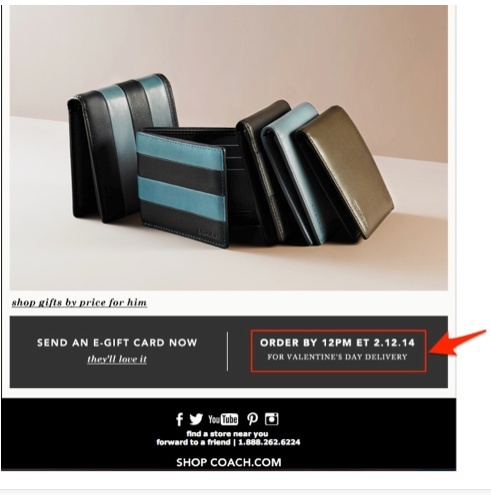 Are they similar to these best email campaigns picked by the experts? 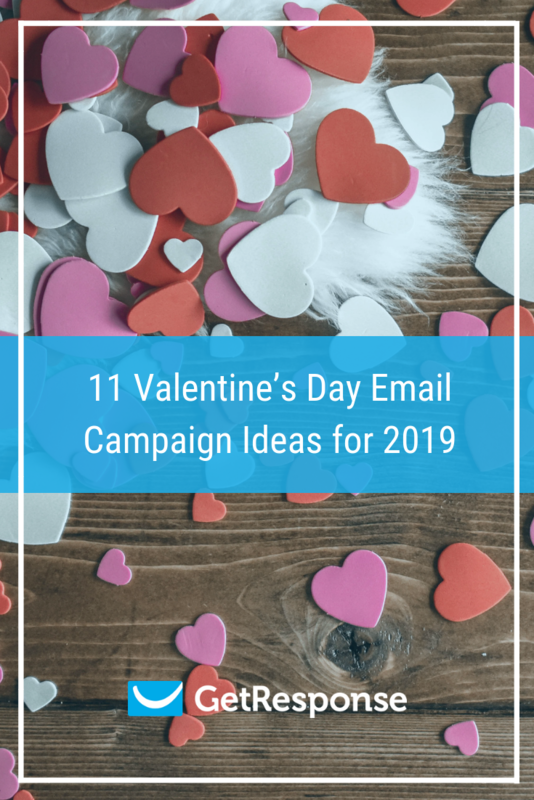 And if you’re ready to create irresistible emails for your V-day campaign, then jump right in and use one of our 500+ free newsletter templates!